Currently, we have Getting Things GNOME!, GToDo and Tasque. While they obviously have their merits and a big history, they fail at least in one of my requirements to be the most awsome task manager ever. Damn, some of the are even unmaintaned these days. Because of that – and because I’m working on many projects that requires me to stay organized – I decided to create a task manager that shall fit the previous points. 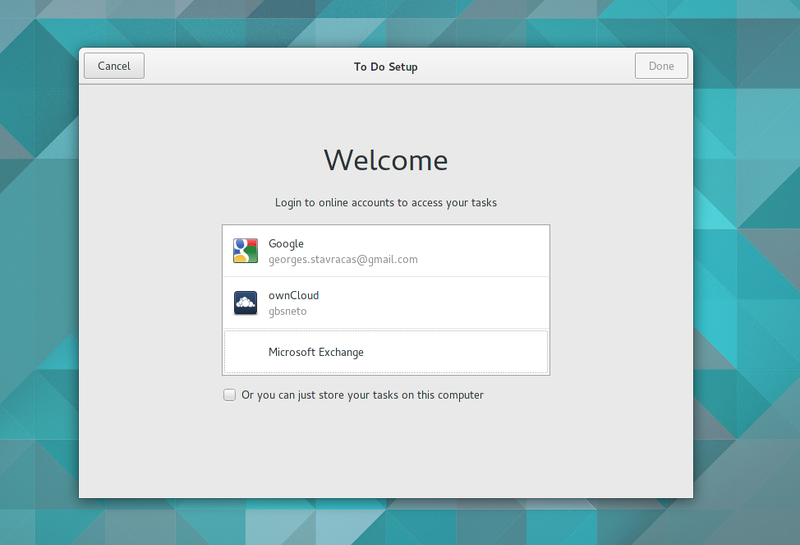 Say hello to GNOME To Do. 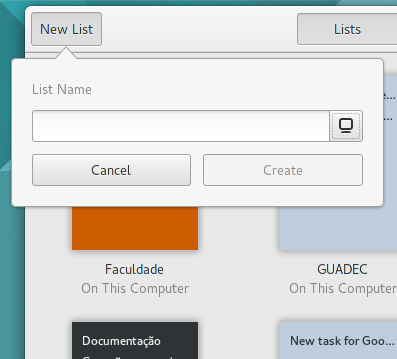 GNOME To Do currently is very simple and unpolished. It uses Evolution-Data-Server to store it’s tasks, and has a primitive integration with Online Accounts. 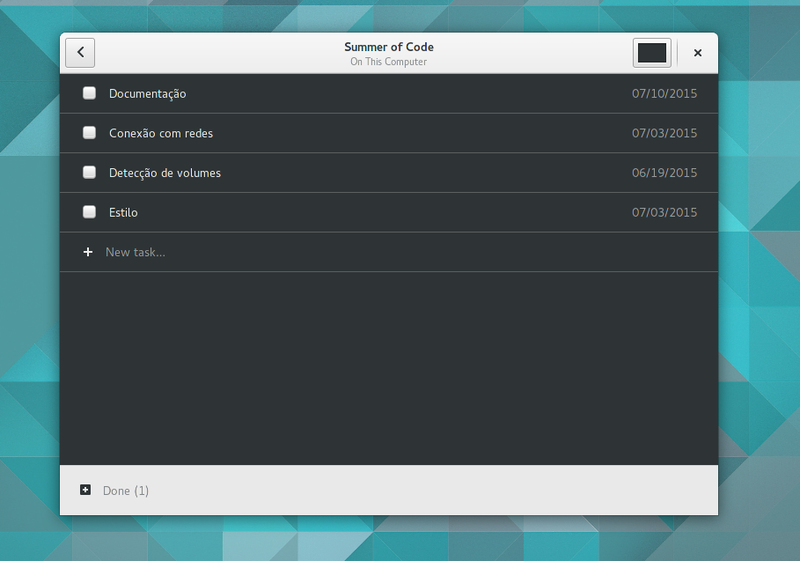 I’m trying to strictly stick with the latest GNOME trends, and some interesting features are already present. It has, for example, a very smooth initial setup proccess (I’m yet to see a GNOME application planned with initial setup in mind from the very beginning). 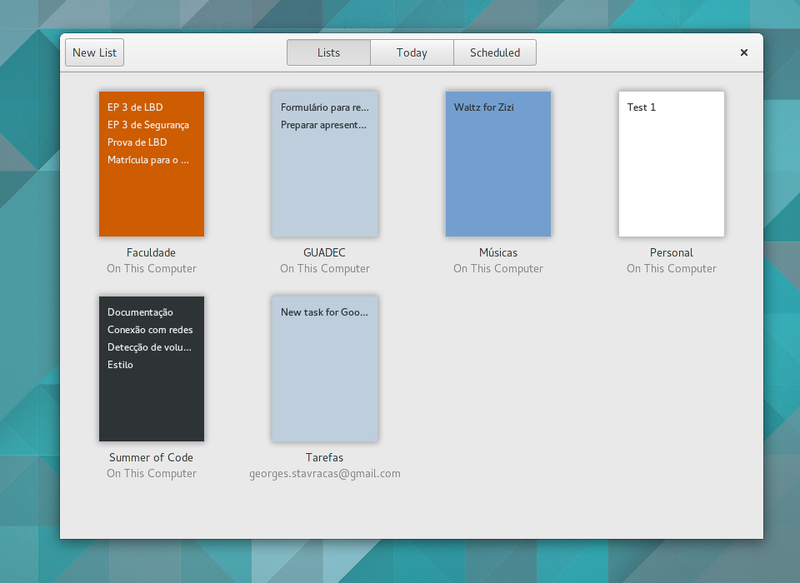 It supports multiple task lists, nicely integrates with GNOME Online Accounts, and task lists can have different colors. Task lists support dark color schemes, and done tasks are hidden by default. You shouldn’t be distracted by your past tasks, unless you bother to seek them. Tasks support notes, priority and due dates. Creating a new task list is also very simple and intuitive, and the user can select the task list’s storage location – where the new task list will be created – in-place. It, however, respects the default location set in the initial setup (and you abviously can change the default one after initial setup too). GNOME To Do is a very young project. It need testing, it has some nasty known bugs, and many features are missing. I will improve it as my schedule let me work on it, and I hope it’ll ready for 3.18 release. Code can be found at GNOME Git repository  and you can jhbuild buildone gnome-todo to build it too. maybe a google keep integration? Unfortunately, Google has no public API for Keep, and so no third-party application can actually interact with it. Nice! I really need this! Thanks! Hope you enjoy it – even if I know it’s in a poor state for now. Very clean design, GOA integration is the selling point. It would be cool to add TODO/GOA support for Bugzilla and debbugs and Launchpad! Make it integrate with Owncloud and also have a format that can be used with Android apps because really, if you can’t integrate it with your smartphone, it’s almost pointless these days. 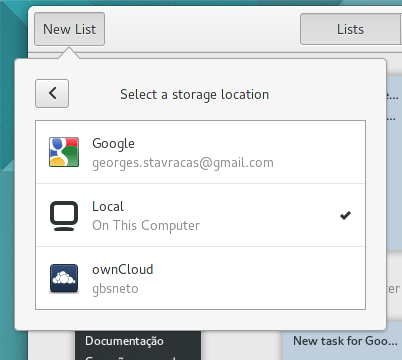 GNOME To Do is already able to use your ownCloud to store tasks. The Android sharing is an interesting point, although other things have higher priority right now. Great work! I’ve been waiting for something like this for quite some time… I’ve made a package for Archlinux on https://aur4.archlinux.org/packages/gnome-todo-git for anyone running Arch. Would be great to have dependencies and related between tasks. Like in bugzilla, but more simple. Wouldn’t “Tasks” be a better name, as it would fit better the gnome app names convention, like “Music”, “Notes”, “Clocks”, etc.? Good work anyway, it has the best design from all task manager I’ve tried, Good luck! I really wish I could rename it to “Tasks”, but it conflicts with the concept of ‘tasks’ as applications. Task Manager can be GNOME System Monitor or GNOME To Do. Maybe not so much in English, but e.g. in Portuguese the names would be exactly the same. To avoid this ambiguity, I choose To Do – there’s no misunderstanding here. an integration with redmine would be very interessting for me – maybe the redmine webapp can lead to an integration? I’d like very much to add integration with every single provider I can. I’ll look forward adding them to Evolution-Data-Server too, and so other GNOME applications would benefit from my work. This is really really interesting! I got a question. What if I create a group of users in my ownClouwd and I create an event. How can my team receive a notification if the all have gnome-todo installed? now running the autogen.sh ! Is compatible with todo.txt and GTD? Compatibility with todo.txt was the first thing I thought of too…todo.txt has been my goto format due to a similar inability to find “the most awesome task manager ever”. However, I also guess that the format may not be flexible enough for this project (eg task notes). 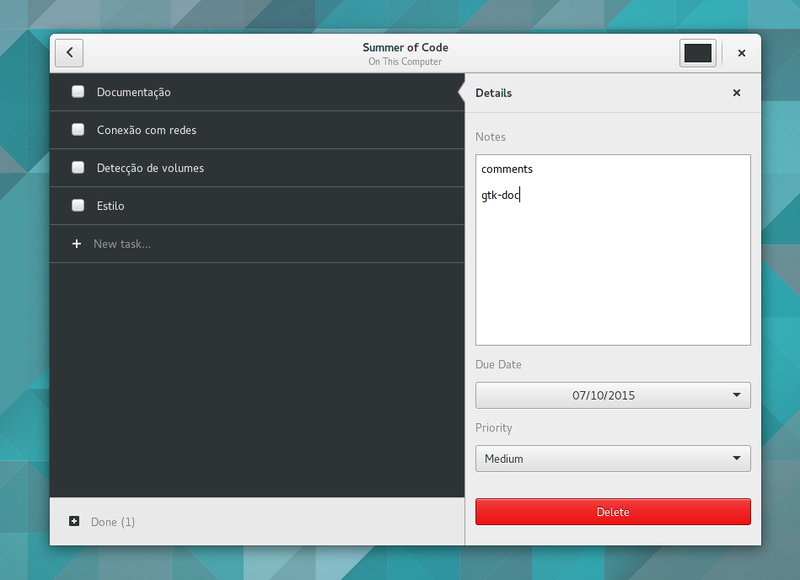 I hope Gnome To Do gains some traction as it looks like the best option so far. It would be interesting to understand what some of the future feature ideas are. Awesome! Bonus points for using evolution-data-server. Awsome!!! Great work!!! Thanks, Georges! Feeling good to see Brazilians around! where to-do data is stored?